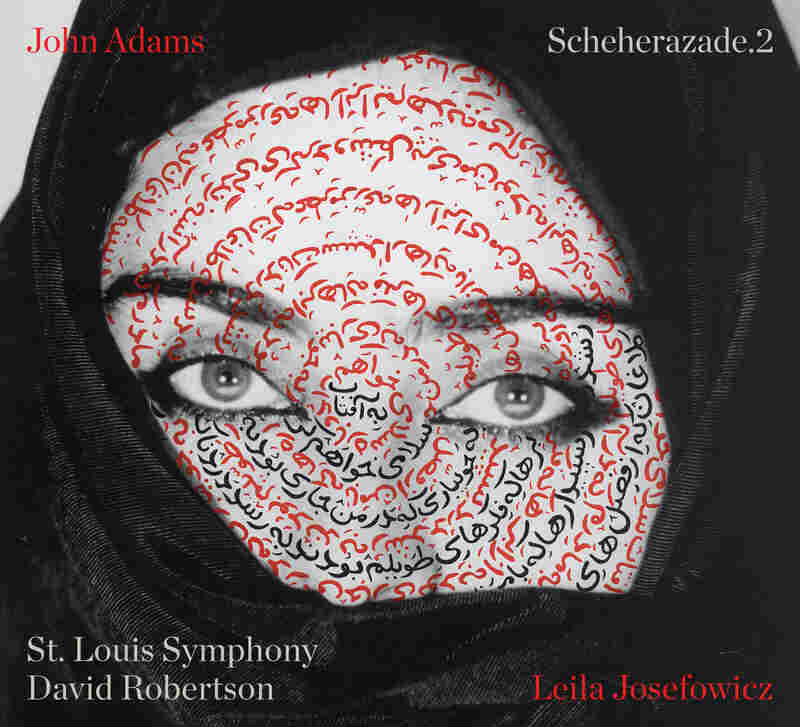 Review: John Adams, 'Scheherazade.2' Violence against women, and a smart storyteller from the Arabian Nights, inspired John Adams' "dramatic symphony," featuring violinist Leila Josefowicz. Note: NPR's First Listen audio comes down after the album is released. However, you can still listen with the Spotify playlist at the bottom of the page. Violence against women is no modern tragedy. Composer John Adams found that out when he saw an exhibition about the tales of the Arabian Nights — ancient stories in which Scheherazade tells her murderous husband a new tantalizing tale each night for 1001 nights, thus sparing her life a day at a time. The composer, writing in Scheherazade.2's booklet notes, says he was surprised by how many of the stories included women suffering brutality. That got Adams thinking about "the many images of women oppressed or abused or violated that we see today in the news on a daily basis." Now, Adams has updated Scheherazade's disturbing story in a 50-minute piece for violin and orchestra. Borrowing a formula from Hector Berlioz (with a nod to Scherherazade, Rimsky-Korsakov's popular symphonic suite), Adams created a "dramatic symphony," casting the violin as a modern-day Scheherazade — the smart woman who remains fearless in the face of cruelty. Over the course of four movements, no precise narrative is spelled out, yet Adams' descriptive titles and his cinematic music go a long way in unfolding a potent drama, masterfully illuminated by conductor David Robertson and the St. Louis Symphony Orchestra. It begins with a strum of harp strings, the whoosh of winds and the clatter of a cimbalom (hammered dulcimer), as if a brightly colored curtain is swept back, inviting listeners inside. Here, we meet Scheherazade in the form of violinist Leila Josefowicz, a longtime Adams collaborator and courageous champion of new music, who gives a searing performance. She arrives with handsome, sinuous lines but later speaks in spikier gestures. In its lyrical moments, backed by Adams' lush orchestration, the music recalls Samuel Barber's beloved Violin Concerto. The vibrant pulsations that open the second movement, "A Long Desire (Love Scene)," give way to a dreamy oasis of floating strings and flickering winds. Scheherazade enters sweet and high as the music grows more impassioned. Her winding, sensual song, one of the work's highlights, is backed by a delicate scrim of strings. "Scheherazade And The Men With Beards," the disruptive third movement, finds our heroine trading arguments with a council of agitated strings, chattering winds and percussion. Her entreaties are mellifluous and articulate, but the opposition overpowers her with snarling brass and thunderous drums. In "Escape, Flight, Sanctuary," Scheherazade makes her getaway amid an outburst of brass. Then she's off and running in frenzied bowing, with wind figures rushing to catch up. The fierceness and vulnerability Josefowicz expresses contributes to an award-caliber performance. Finally, palatial walls of Sibelius-like string textures enfold Scheherazade. She's found refuge, but who knows how safe she really is?